When Musto launched the GWCT jacket 3 years ago, it was technically a great jacket, with all the features you’d want and it looked great. However for a jacket that was so well designed and constructed it never really caught the imagination of the shooters like it should have, and whilst those who bought it were undoubtedly pleased with their purchase, it didn’t sell like you might have expected. I believe there were probably 2 reasons for that, firstly it had a clunky name that no one could remember (to be fair GWCT is the abbreviation of Game and Wildlife Conservation Trust who helped design the jacket), and the second problem was the colour, it was just a shade to light for the inherently conservative shooting market. Musto have put both problems right with a new version of the Jacket for the 2012/13 season, to be called the Musto Loddington Jacket. Essentially the same jacket, and still in collaboration with the GWCT who receive a percentage of the sale from every jacket, the new Loddington is in a much more pleasing darker green. Aside from those changes the jacket maintains the features of the original GWCT jacket. When the design team at Musto started work on the original jacket their brief was to make the ultimate shooting jacket, to exceed the very best on the market at that time (Schoffel’s Ptarmigan and Barbour’s Linhope), and they did a good job. 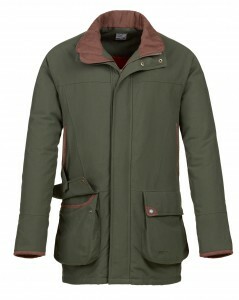 Featuring a fully breathable Gore-Tex lining, the jacket is light, its smart, it allows great freedom of movement when you reach for those higher birds, the pockets are all in the right place, the attention to detail really was very good, so with a bit of luck now re-launched and renamed this jacket should take its place at the top of the pile, as the ultimate shooting jacket. Musto GWCT Jacket, Musto Loddington Jacket, Musto Shooting Jacket. Bookmark.